Fat Chili Farm, a producer of local chilies, is located in Cobble Hill and is owned and operated by Shani and Avasta Farboud. Producing one of the most unique products in the area, this family run farm opened in 2010 after the Farboud’s moved to Canada from Beijing. 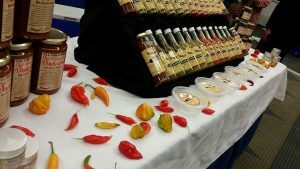 Turn their love of spicy food into an ever growing business, Fat Chili Farm has definitely found a niche market here in the Cowichan Valley! Within three large greenhouses, Fat Chili Farm grows all their own chilies on their three and a half acre property located on Telegraph Road. Boasting over thirty varieties of chilies, which are organically grown, varieties of interest include the ghost pepper and the hottest pepper in the world - the Carolina Reaper. Their peppers are used in a number of very unique products such as hot sauces, chili jellies, BBQ sauces, hummus, mustards, syrups, and many other chili-infused products. On top of creating all their amazing sauces, they also offer farm tours and are starting to branch out into the catering and event planning business specializing in East Indian cuisine. There are also plans to open a new Soup Shack in the fall of 2015 on Fisher Road in Cobble Hill. 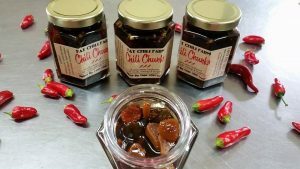 All Fat Chili Farm products can be purchased at the new Soup Shack, year around at the Saturday Farmers’ Market in Duncan and the Victoria Public Market at the Hudson, and seasonally at the Cedar Farmers’ Market and the Sidney Farmers’ Market.